One of the more common types of small caliber ammunition, the copper-plated round nose can be carried, sold and fired just about anywhere. While the average round nose is becoming less common due to lead concerns, copper plating added during the manufacturing process has become an easy and affordable solution. If you spent time around firearms as a kid, chances are you probably first shot .22 caliber CPRN bullets or their hollow point brother, the CPHP. These are so popular, you can find them in almost every country around the world for small game hunting and backyard shooting. 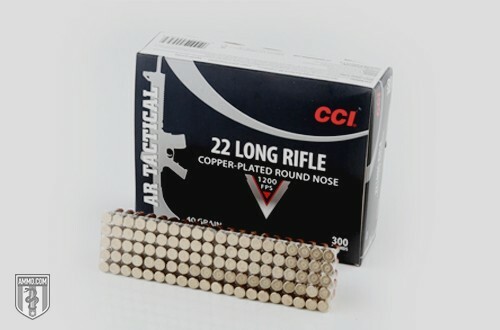 One of the most prominent manufacturers of CPRN bullets is CCI, as they offer these bullets in ammunition for .22 LR, long and even .22 short. Many people religiously use CPRN bullets for shooting small game like squirrels, and even birds. Since these bullets are accurate and cheap, you can bring home a nice haul without breaking the bank. The copper plating allows you to shoot them in areas where straight lead is prohibited, like public lands. However, you won’t be bringing down large deer with this ammunition. This ammo type is especially known for varmint control. If you have a problem on your property with gophers, rabbits, crows, foxes or just about anything that is a threat to your crops or small livestock – the CPRN bullet has been used successfully for decades to stop these critters immediately. A good, clean shot will likely result in a kill. But if you find the power a bit lacking, you can always jump up a caliber or switch to a hollow point. These rounds do tend to ricochet, so make sure you aren’t aiming at a small target directly in front of a huge rock or solid piece of metal. Always use your judgment before firing, and remember the best backstops are dirt and grass. When shooting targets, cans and bottles on your property, this round performs perfectly. It has a good balance of power and accuracy, and these typically don’t hit you with much kick as you fire. This can depend on whether you’re using a pistol or rifle, of course. But it’s a lot of fun and can be a family bonding activity to blow through a few rounds on the weekend. If shooting cans and targets on your property, you want a quiet round, and the .22 CPRN is very quiet compared to most other ammo types. You can fire off tons of rounds without disturbing your neighbors, or even family members who are in your home or on your property.